Readers rejoice: There�s plenty of room at the town�s 25,000-square-foot library. Settled by Quakers in the 1600s, this historic town in Montgomery County lies within easy commuting distance of Philadelphia. Two other pluses: Low crime and good schools. 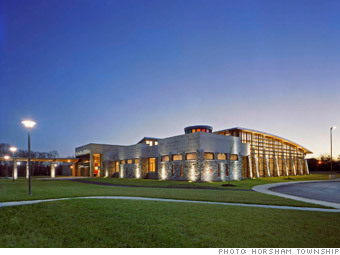 Residents are proud of their 25,000-square-foot library, which opened in 2004. One negative: A naval air base here was shut down in 2011, causing some job losses. But the corporate headquarters of several large companies, including Nutrisystem and Toll Brothers, are still here. --D.B. Is Horsham a great town, or what?